True chestnuts are in the genus Castanea, which worldwide includes only eight or nine different species of deciduous trees and shrubs. 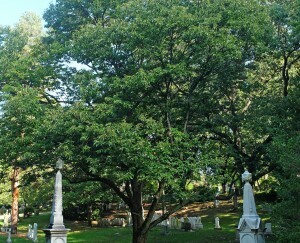 Here at Mount Auburn we grow Chinese chestnuts, Castenea mollissima. In October you may come upon the curiously noticeable fruits (nuts) on the ground beneath these trees. 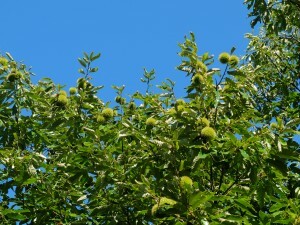 Noted plantsman Michael Dirr in his Dirr’s Hardy Trees and Shrubs aptly describes them, “The edible nuts are borne two to three together in a prickly structure not unlike a mini-porcupine.” As with all plants, these fruits were preceded by their successfully fertilized flowers. Occurring mid-to-late June, each tree develops separate male and female flowers. The ornamentally visible male, or staminate, flowers are pale yellow or cream colored, cylindrically clustered along erect catkins, 3-to-8-inches long. These male flowers are very aromatic, although many say this odor is unpleasant. Separate less visible female flowers found at the base of some male catkins, may eventually produce the prickly burr covering the nuts. The nuts are prized edibles, and over time hundreds of cultivated varieties of Chinese chestnuts have been selected and introduced. The nuts have little protein or fat, and no gluten, and are primarily carbohydrates. Chestnuts are also used in Traditional Chinese Medicine (TCM) to improve blood circulation, prevent and improve high blood pressure, heart disease, and osteoporosis, in addition to other uses. 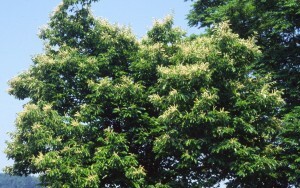 Chinese chestnut trees grow forty-feet tall and may be equally as wide. 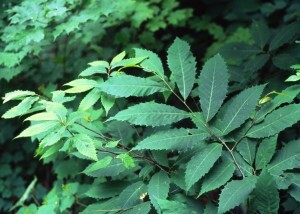 The alternate, 3-to-6-inch long, lustrous green leaves have a serrated margin, many culminating with bristle like teeth. Autumn color ranges from yellow to light bronze, and the leaves may persist on the tree long into the season, as do some oaks and beeches, which all are related within the FAGACEAE, or beech family. 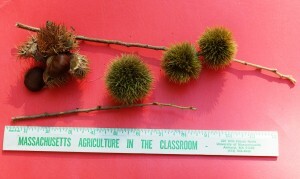 While we do not grow other species of chestnuts, two other very similar species are worth mentioning. Sweet chestnut, Castanea sativa is native to southern Europe, western Asia and northern Africa, and has long been a staple subsistence food. Evidence of its cultivation dates back four millennia. It was repeatedly planted across vast geographic areas by Alexander the Great (356-323 BC) as well as by the Romans in ancient times. Today it remains a valuable export for Turkey, Italy, Greece, Portugal and Spain. 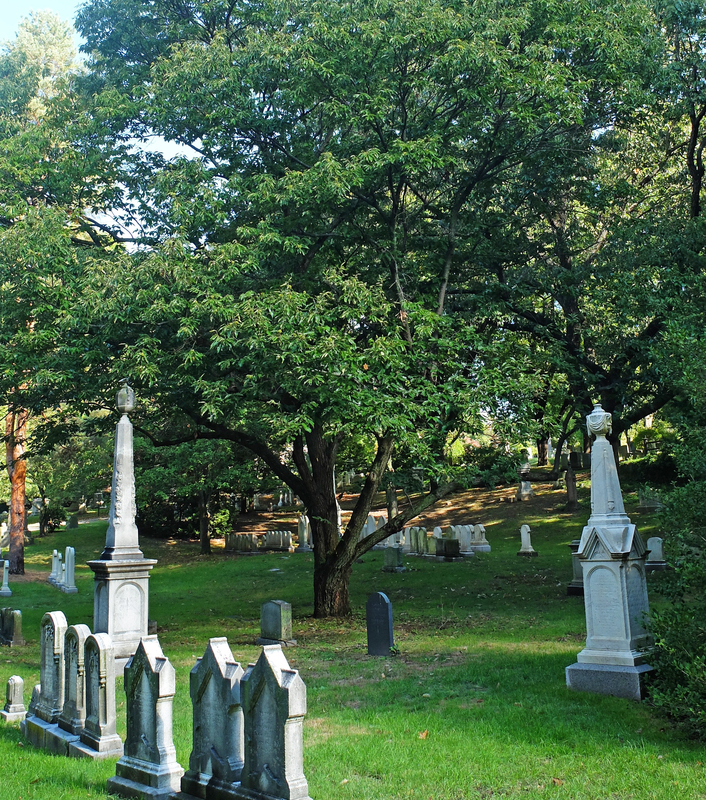 Many Mount Auburn visitors regularly shop for these chestnuts just six to eight blocks west of Mount Auburn Cemetery, on Mount Auburn Street in Watertown. The Chinese chestnut, Castenea mollissima and other Asian chestnut species evolving over time in coexistence with this fungal blight have a high degree of resistance, and suffer minimal damage when exposed. Herein our tree tragedy finds a ray of hope. By creating a hybrid tree from crossing a scarce surviving American chestnut with a Chinese chestnut, the resulting offspring will comprise an approximately 50/50 progeny. 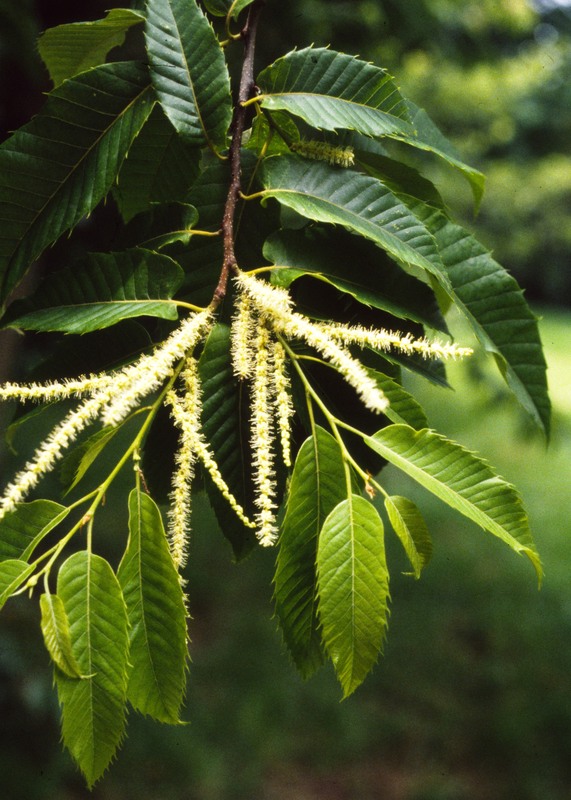 By crossing this hybrid once again with another American chestnut, and then crossing that progeny again with another American chestnut, and so on, this process is known as backcrossing. 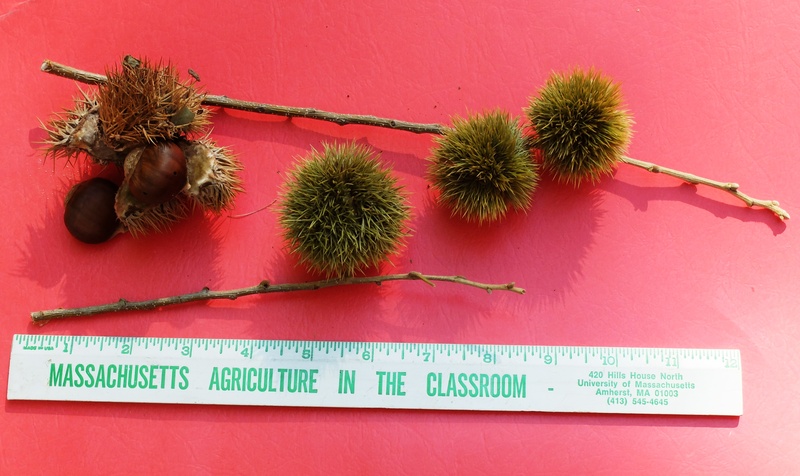 Backcrossing to a generation of progeny with 15/16ths American chestnut, might have introduced just enough resistance from the Chinese chestnut. 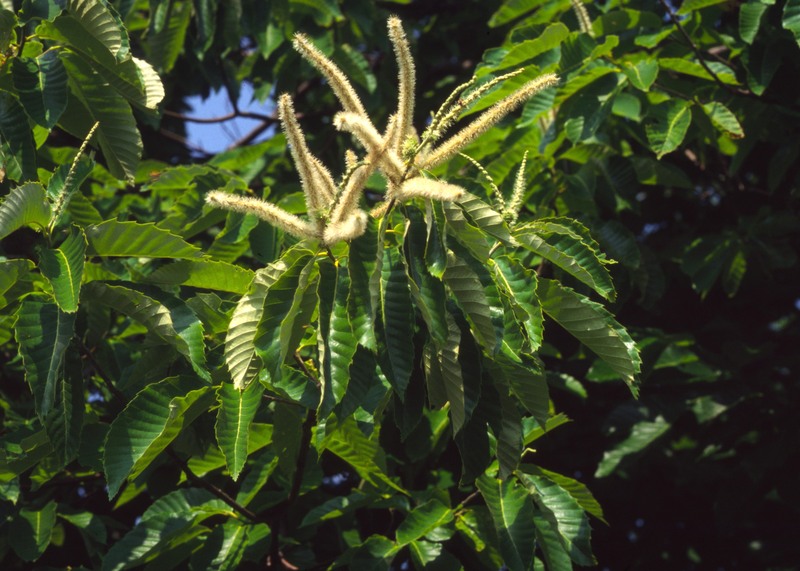 There has also been considerable work using genetic bioengineering with a goal of inserting resistant genes into American chestnuts. 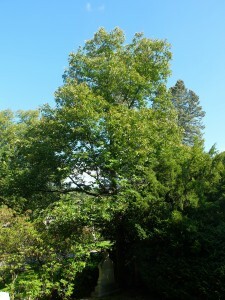 The hope of introducing a close to resistant American chestnut, Castanea dentata appears before us. Of course only time will tell, but Freinkel quotes longtime chestnut researcher Dennis Fulbright, “It would be just like getting a gift from the heavens.” On your next visit to Mount Auburn look for our Chinese chestnut, Castenea mollissima on Hibiscus Path, Gladiolus Path and Cowslip Path. In 2008 a 20 or so tall american chestnut [C. dentata] produced flowers and what we hopefully thought fruit; not surprisingly the shells were empty. I tried to communicate with an organization promoting cross pollination described above but never had a reply. I’ve also visited the experimental plantings at Tower Hill Botanical Garden near Worcester about 8 years ago but it seemed to be uncared for. We buried my wife today [22OCT16] in a green plot on Daffodil Path near a Japanese Pagoda tree – next time I’m there I’ll look for the C. mollisima’s. 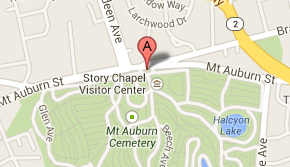 I am very grateful for the good care of the vegetation taken by the cemetery. Thank you for your kind words. I hope that you continue to find comfort and inspiration in our landscape.